At the Westmont Village Board Meeting on June 22, Mayor Ron Gunter presented the Key To The Village to Steven Lin from TECO-Chicago. 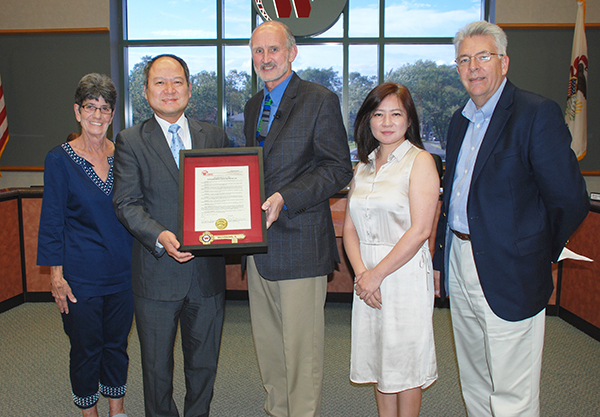 The Village Board also approved a proclamation honoring Lin for his commitment to building a strong relationship between the Village of Westmont and TECO. Lin has also been a strong supporter of Westmont’s Sister City initiative. Lin served as the Administrative Director for TECO Chicago for the past 6 years and is now returning to Taiwan for his next official assignment. The Village of Westmont thanks Steven for his time and dedication, and we wish him great success on his next assignment.